OÙ VOUS POURRIEZ EN APPRENDRE PLUS SUR LE RFSC. What is the new RFSC framework? What new developments does it have, and how can it help European towns and cities in terms of sustainable development? 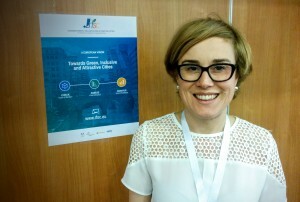 To answer these questions, Delphine Gaudart, Project Manager for RFSC (Reference Framework for Sustainable Cities) at the French Ministry of Housing and Sustainable Homes, gave an interview to Cities Today. This interview took place after the latest version of the RFSC was launched at the CEMR congress in Nicosia, Cyprus. What does the new framework set out to achieve? The Reference Framework for Sustainable Cities (RFSC) is a web tool to help cities achieve sustainable urban goals in an integrated way. It allows cities to put their projects on the Internet and to take part in a community of users. They can register and work for themselves with the RFSC. What is new about this version? The RFSC is an intergovernmental initiative with the support of EU institutions and the support of CEMR. But now the big change with this version is that it is more self-explanatory and simpler, as the previous editions were a bit more complicated and not accessible to all stakeholders. It is for cities but all stakeholders can register. What interest has been shown by cities? The previous version we had about 300 different kind of users, including visitors and about 100 cities that used the RFSC. We hope to get more cities using it. All types of cities were using it but those that are most interested are medium sized cities. Big cities often already have their own tools which they have developed as they have the resources and expertise. Medium sized cities often don’t have the resources or the time so that is why we wanted to make the web tool very easy and accessible. Is it only for the pre-planning stage or can it be used at later stages? I would say both, because you can stop at the very beginning of the first stage when you have to think about your project profile. It can also be for finished projects that need to be assessed and evaluated using indicators. What sets this framework apart from others? There are other tools out there but they really only focus on the indicators. There are charters as well but there is no tool that brings it all together, including self-assessment and having a database of indicators to be used by cities on all sustainability issues. The objective is not to provide a ranking of cities. Our goal is to get the cities to put the information in by themselves. It is a tool for ‘bench learning’ not for benchmarking. Having said that we know it is difficult for cities if they don’t achieve what they wanted to set out to achieve as it will show the gap that exists between ambitions and real actions taken. We understand that some cities will be uncomfortable to show all the users in the community that they have big ambitions that lack actions. But we think this is not the point, it is a way to foster dialogue and achieve an integrated approach to sustainable development.